Take advantage of our huge inventory sale for a limited time! Choose FREE SHIPPING when you purchase two or more patterns! 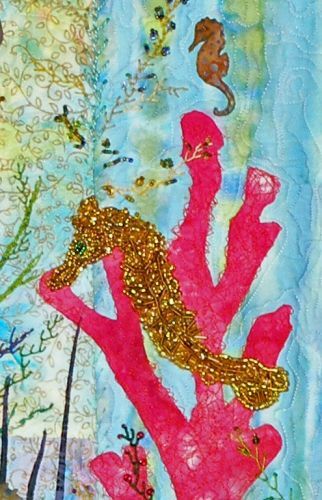 There are nine Seahorses and a Sea Dragon with coral and seaweed. The technique for appliqué is raw edge stitching (straight stitching using a darning foot) and the embellishment, if you care to add it, is hand embroidery using feather stitch and chain stitch for the seaweeds, and two methods of hand beading. The instructions include directions for machine quilting and putting on the sleeve and binding, and signing your name in free hand stitching. We added color close up detail photos to the back side of the cover on both the snail mail printed pattern and the PDF file pattern. The Quilt in the photo is 26" x 28". Sorry, PDF file patterns are not available to wholesalers. We have How to Applique videos if you learn visually. Watch our designer, Debora Konchinsky take you through all the steps to make a Critter Pattern Works quilt. When you order a PDF pattern, the download location will be sent within 24 hours of placing your order. 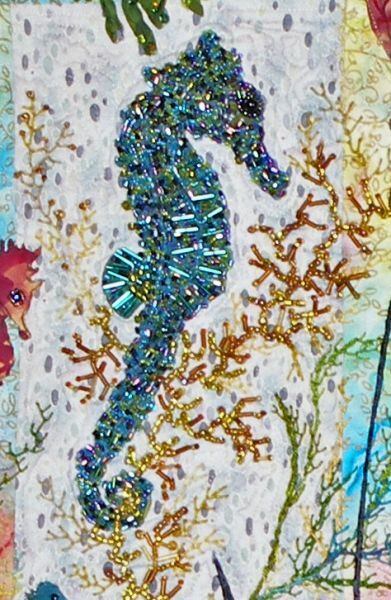 The blue beads on this seahorse completely cover the raw edge applique. The beading was done in strings of beads with couching every so often to keep the beads for moving. 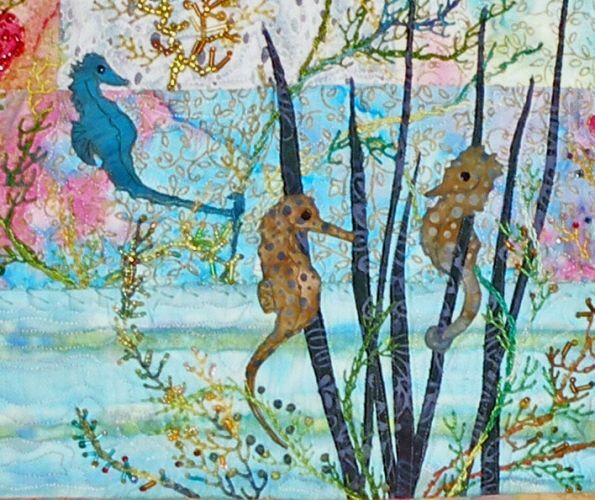 The white spots on the seahorse in the photo are really reflected light, not missing beads. 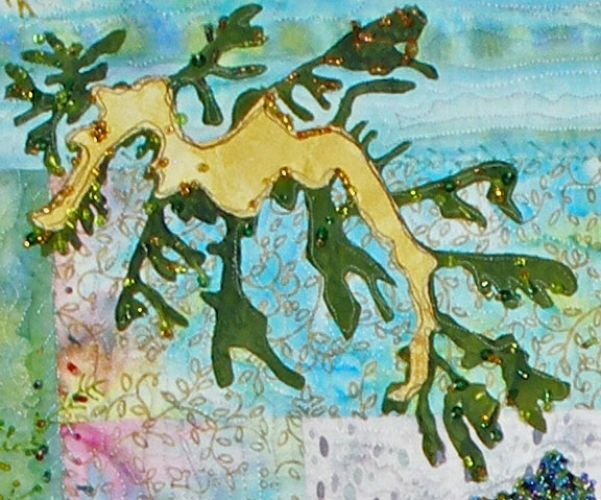 Weedy Sea Dragon lives in the ocean south of Australia. 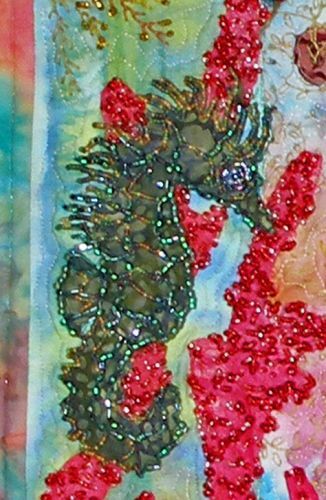 This seahorse is beaded only where the detail lines are in the pattern drawing. Great batik fabrics and a few beads. The coral isn't beaded but stitched with a decorative stitch using the darning foot for irregular design.